A lot of people have asked about books on Please Save My Earth, specifically where I get a lot of the pictures used on the Web page. This page is meant to be a listing of some of the books, though it isn't a definitive list by any means. If you really like the show, and you want something more than just the videos, try ordering the books! 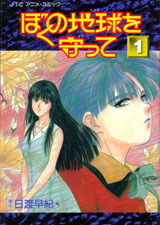 The first available source of pictures (but maybe the least spectacular) is the manga itself. There are 21 volumes in the series, and you should be able to buy these at any Kinokuniya Books or other Japanese book store. 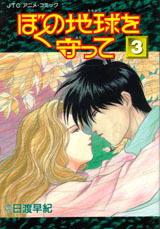 Though the manga itself is in black and white, the covers are in color and contain many beautiful pictures. Besides, even the black and white interiors have some great stuff. Miss Hiwatari draws PSME with a comic touch that is at once touching and amusing, and there are plenty of panels where, seeing the way Alice or Rin looks, I had to laugh out loud. If you're looking for the manga and need the book numbers for ordering, I've listed the first twelve volumes here. You should be able to order any other volumes you need if you can get just one of them. 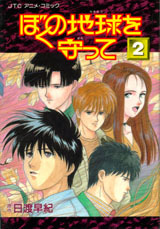 The first volume of the anime comic covers roughly the first two episodes. Each of the two additional comics cover roughly two episodes each, although the third comic also has a brief portion with the new material from the PSME Movie. This is an interesting addition to the line of PSME books, as it contains quite a lot of information and also some very nice pictures. 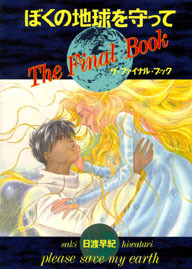 Most of the pictures are watercolors, large-scale reproductions of the manga covers. However, there are other pictures, such as all six video tape covers, photos of various PSME paraphenalia, some international editions of the manga itself, and more. A lot of background material that is not present in either the manga or the OAVs can be found here, such as the number of planets in the crew's home system, along with a black and white illustration. There is also information about the state religion, and character backgrounds and illustrations. If you can only afford to get one book, this may be the one to get. The entire manga series will probably run you a lot of money, unless you can find a really cheap source for them or can get them used, and the same goes for the anime comics. However, The Final Book is only one volume and contains enough information and pictures to make it worthwhile. So if you want to order this one, the information is: PSME - The Final Book - ISBN4-592-723122-0.